It's been a long time, isn't it? Well, just to show that we're still alive and the project is paused but not dead (we've put too much time and energies to just abandon it - we *have* to complete and release it someday), we uploaded on YT a gameplay video: it's the beginning of "Hunting the Hunter". It's a small part of what we released to Italian beta testers around three years ago. So, click here to watch the video on YT! About a year after the last update of this post, I'm here to tell you that the first part of our game has been released to italian beta testers. It's our first "big" release, after the old tech demo and the prologue (to italian testers) about a year ago. We are now waiting for feedback and of course we would appreciate any of you AGS guys (able to understand italian, of course) joining the beta testing, so if interested just step here. If you want, you can support our recently opened facebook page, we'll post some minor news and background material there, at least until we go for a site renewal. So, SOTE is *alive*, slowly approaching the complete public release. Trust us: we worked too long and hard to abandon the project, so, someday, the complete, international release will happen. Isn't 08/08/08 a nice date to show you a pair of screenshots from Hunting the Hunter? I hope that you like it as I do! first, SOTE is *not* dead as often they ask us. We had many work/studying slow downs in the past years, but we're not gonna let the project die. And in this August we're working passionately to complete the first episode of the full game, that we named "Hunting the Hunter". While it covers just part of the SOTE storyline, it should feature some hours of gameplay (with a pair of little surprises). We hope to start the beta testing/translation phase in a few weeks, so if you're interested in helping just step into our forums and let us know. I hope to post some other news in the near feature! the website hasn't been updated yet because BobaFonts is busy with Episode III stuff for guerrestellari.net ... by the way, the archive in online (a tar.bz2 one, use winrar on windows and "tar xjf sote_adventure_tech_demo_1.1.tar.bz2" on linux). Who should really download it? - Linux users, because it contains fixed scripts and the updated engine by EvilTypeGuy, and the game doesn't crash anymore. We're a bit busy with work/university at this time, but work on SOTE (slowly) goes on. Bye! Thanks for the 6000 and more downloads of the SOTE Tech Demo! Finally, the SOTE tech demo download. The site hasn't been updated yet, but the archive is there, ready to be downloaded! Mods: the tech demo is in practice a complete short-game... can we insert it in the AGS Games page? Ok people, we (almost) did it. We released a first italian-only beta of the SOTE Tech Demo to a limited number of testers a few days ago, and we plan to upload a new beta as soon as the English translation will be complete. We fixed what we could, but we still have a pair of problems, maybe engine related (we'll ask in the Tech Forum as soon as the beta2 is uploaded). We won't publish a download link here on the forums because we'd like to have a bugfree public release, I hope you understand us. By the way, if anyone of you wants to be added to the tester mailing list to help us, this is a good moment to ask. 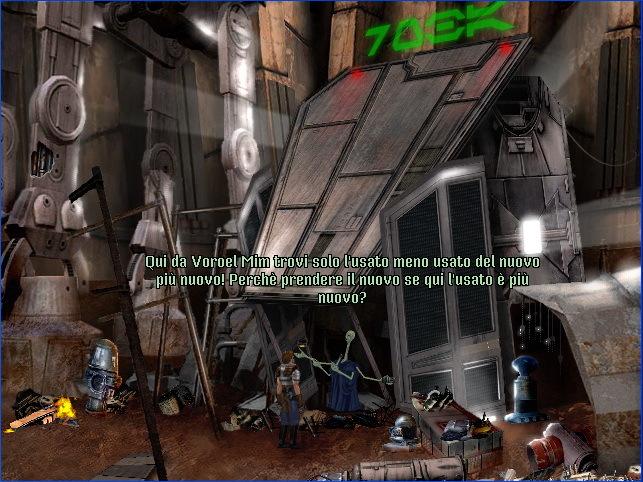 I'm very happy to finally introduce on the AGS Forums "Star Wars Shadows of the Empire: Graphic Adventure". We're working on it since April and now we have enough stuff to introduce our work, including about 40 backgrounds and a working multi-character personalized interface that required many hours and many hundred lines of code. Today we've opened the SOTE:GA website, that I hope you'll give a look, where you can find more info. I hope we'll release a tech demo soon and a game playable demo around Christmas, but nothing is sure at the moment. The plot is an expansion to the union of the Shadows of the Empire book/comic book/action videogame, and in our plans it will be a really long game. Wow, he sure carries alot of blue cups. Are those backgrounds original cause they look awesome. By the way, thanks for the immediate feedback! Hey that's what forums are for. Good luck with the game! Looks like you guys have put a lot of thought and work into it so far. Good job and I wish you great success for your project. I used to be a real Star-Wars fan, and sort of still am (though I'm more of a fan of the first original three movies). If you need any advice / input from an older-timer Star Wars fan, just ask. Looking forwards to seeing your completed game in action. *May the Force be with you. 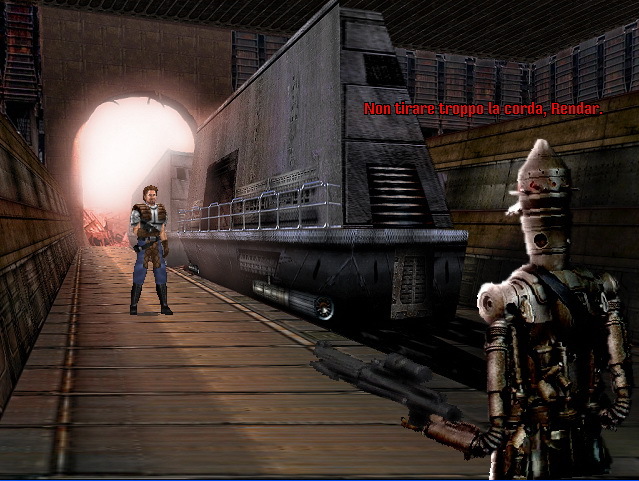 Same here, i've always waned to see Star Wars fan games and the backgrounds look great! As if LEC's 5 SW games a year weren't enough.... Still as I said this looks cool, I'll definantly play it! It'll probobly be better than most of LEC's crap star wars money makers! Though I will say this: KEEP THIS UNDER THE RADAR. LEC has lawyers with itchy trigger fingers, man. Thankyou! Your Star Wars knowledge will be obiovlsy useful in testing phase. By the way, we prefer the original three movies too. Thanks. Yes, we thought that... we wrote the disclaimer on the website trying to be clear about the fact that SOTE is a no-profit project and that we don't want to damage LEC and Star Wars copyright owners in any way... let's hope they'll let us finish the game. I too am a HUGE (old school) Star Wars fan. I was working on my own Star Wars game awhile back ... but anyway, if you need any help (as Barbarian said) let me know I'd be happy to lend my [geeky] knowledge to your cause. Right, that's it, anymore use of Force clichés in this thread will be dealt with severely! Master of the sith AGA is. Dark force within him there be. Im not a great SW fan but this game looks great! I cant wait for it. Anger, fear, agression ... the darkside are they. Remember AGA, once you travel down the darkside, forever will it dominate your destiny. What ya gonna do? Force people to stop? If you guys weren't slightly amusing, your posts would be SO deleted. but anyway, if you need any help (as Barbarian said) let me know I'd be happy to lend my [geeky] knowledge to your cause. This really looks like a great project you've got here. I love the way Luke blends in with the fantastic graphics, and the interface looks very detailed too. It really looks like you guys know what you're doing here. This game looks really good, keep up the good work.